Get the satisfaction of a Philly cheesesteak without all that bread in this hearty dinner. 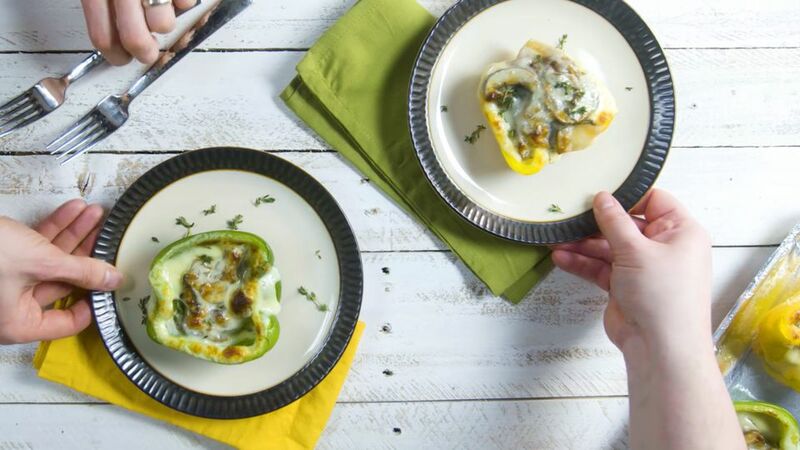 Bell peppers are filled with provolone cheese, steak, and caramelized onions and mushrooms, then cooked until the peppers are soft and cheese bubbly and a bit browned. The result is high in protein and comfort, low in leftovers. Salt and pepper steak. Cook (grill or pan fry) over high heat about 2 minutes per side. Slice the peppers in half lengthwise. Clean and remove the seeds. Thinly slice the onions and mushrooms. Saute over medium heat with butter, olive oil, thyme and salt and pepper to taste. Cook until caramelized, about 30 minutes. Slice the steak into thin strips or bite-size pieces. Line the inside of each pepper half with a slice of provolone cheese. Fill each pepper half with meat and some onion mixture until they are packed high and almost overflowing. Top each pepper with another slice of cheese. Bake for 15 to 20 minutes until the cheese is golden brown and bubbling.